TubeNet • View topic - My "New" Toy! Well, I went and picked up that small Eb off of craigslist, so I thought I'd post some pictures of it. It's in very ok shape considering. I honestly thought it would be a lot more dented, but most of the dents look like they should come out pretty well with my magnets and balls. The valves are free, but the slides are all stuck. We'll see if they loosen up after a bath. Any suggestions for removing the tarnish? I've got comments and some questions along with each picture. Thanks for looking! 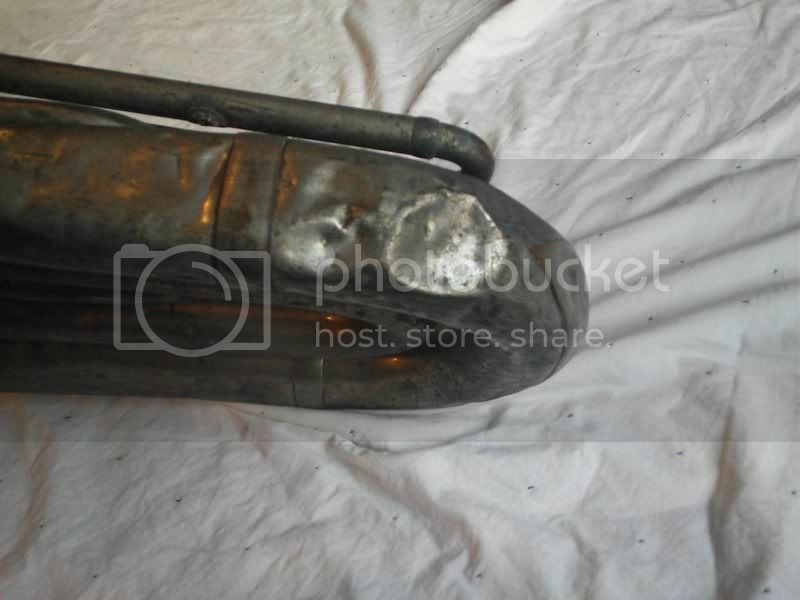 The lead pipe looks like it had a leak or something that someone globbed solder onto. 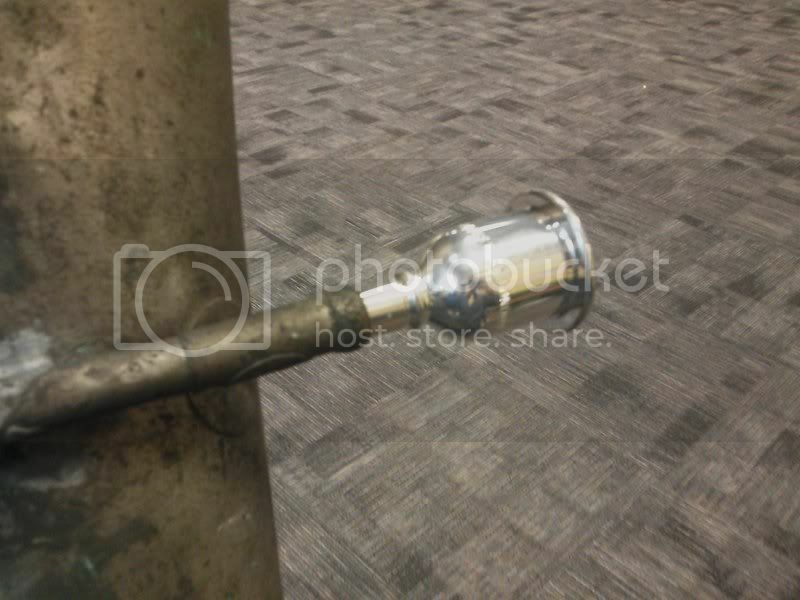 Would it be possible to replace just the first "branch" of the lead pipe? It's missing the spit valve, but even with that covered up, I can hear more leaks somewhere. This is the part I'm most worried about. I'm worried that knuckle got torn off the valve casing or something and this was someone's quick fix. I haven't put any heat to anything yet, but does that look like solder or JB Weld or something? Like I said earlier, most of the dents look reachable with my magnets and balls. That is, unless I feel like tackling the ever-present flat side of horn. 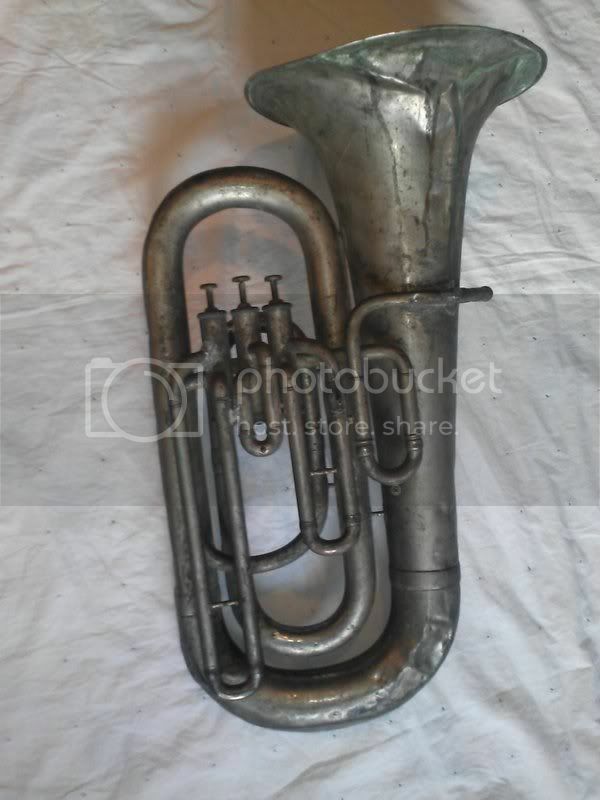 This is my first Eb tuba, and I don't have my calipers at home at the moment, so what size mouthpiece would work best on these size horns? You can see that my Kellyberg didn't go in too far. I'm not exactly sure what I want to do with this down the road. I might keep it, resell it, or (here's my project that will probably never happen) flip the bows, get a 4 or 5 valve cluster and cut it down to a nice, small F tuba! Thanks for looking and offering any insights, answers, etc! That definitely looks like JB Weld on the Valve Knuckle. The problem with that junk is that (to my knowledge) It has to be filed off. Hopefully the casing isn't torn to shreds underneath all of that. 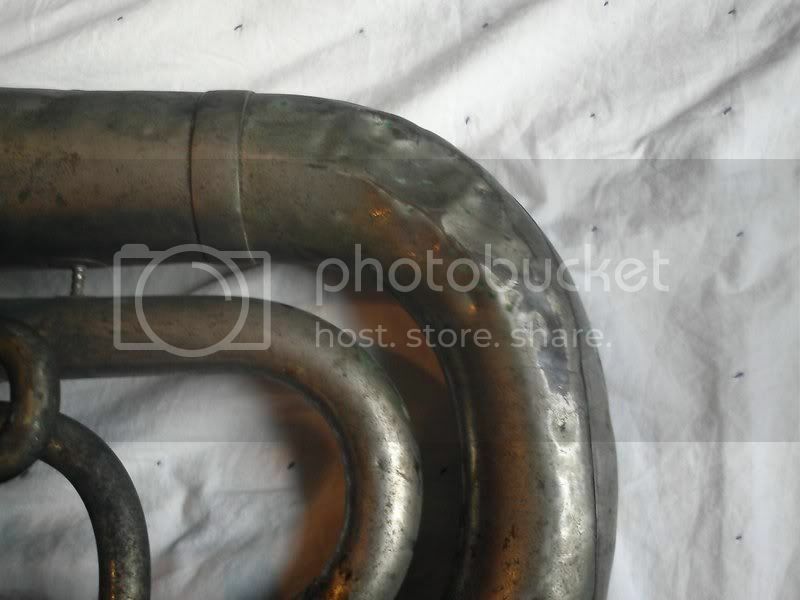 Tubajug wrote: This is my first Eb tuba, and I don't have my calipers at home at the moment, so what size mouthpiece would work best on these size horns? You can see that my Kellyberg didn't go in too far. I'm pretty sure a standard-shank mouthpiece fitted deeper than that in my small-euro (Boosey) receiver, so your instrument may have a "Medium-Euph" receiver. 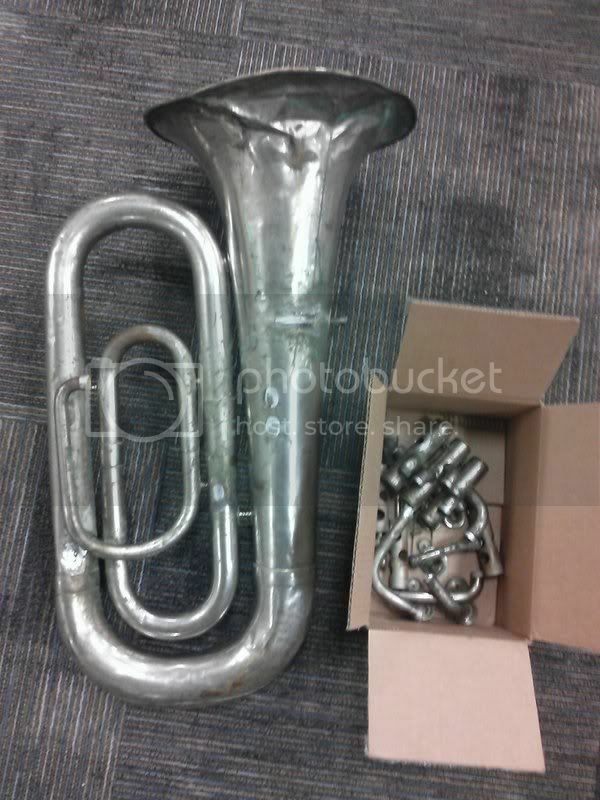 I read somewhere that some early tubas were built that way for town bands, so the euph player could double on tuba with the same mouthpiece. "Boosey" sized mouthpieces are hard to come by at a good price.The Dennis Wicks are nearly $100. You could try a bass trombone sized mouthpiece but the results will probably not be satisfactory. You could look for a cheapish 18 sized mouthpiece and shave down the shank. 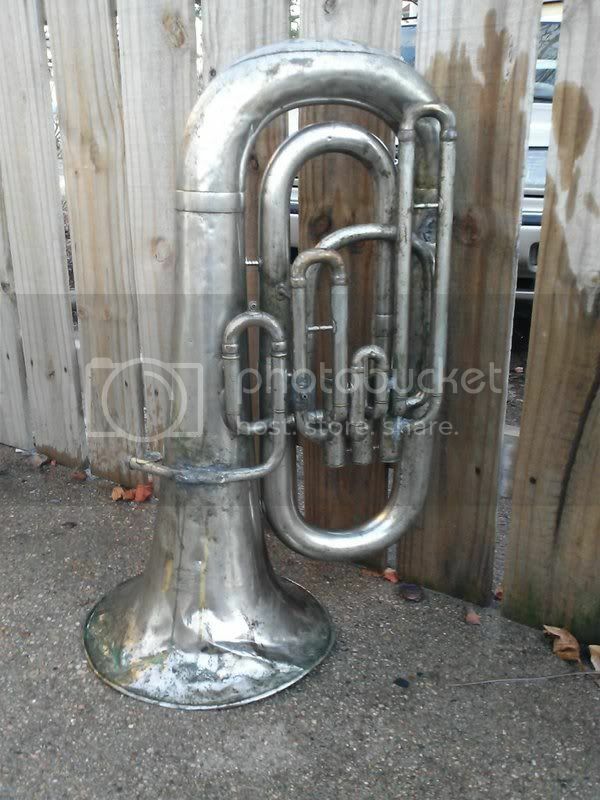 I have also used the Yamaha Bobo tenor tuba replica with some success on my EEb. 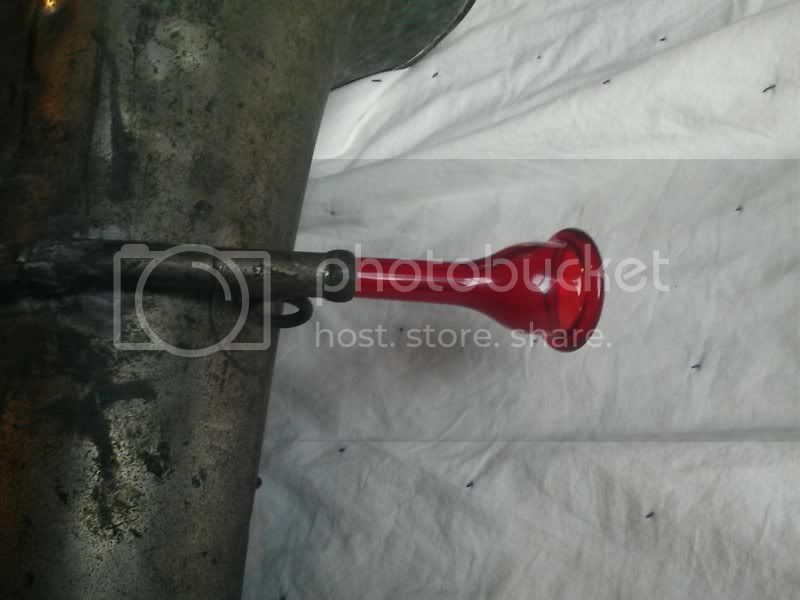 If this horn has a medium shank receiver, order a new part from somewhere and change it. Or better yet, you for a use leadpipe that might fit yours and that has a better sized receiver. MikeW wrote: I'm pretty sure a standard-shank mouthpiece fitted deeper than that in my small-euro (Boosey) receiver, so your instrument may have a "Medium-Euph" receiver. There's some variation. 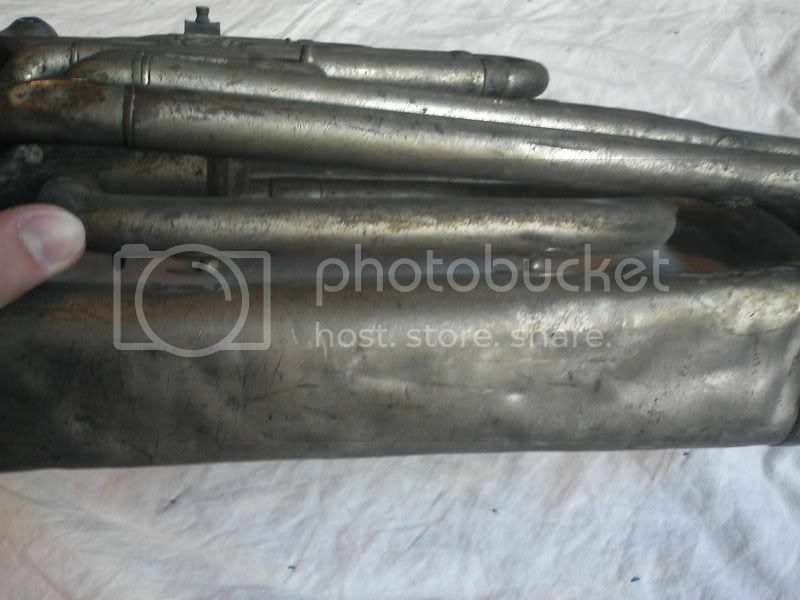 Standard shank won't go in my Italian Eb at all, but small (Eb) tuba shank is OK. That's the best bet for starters, unless you want to try for an accurate measurement. On the other hand, that leadpipe is toast, so your money would be much better spent towards a new leadpipe and (large shank) receiver. 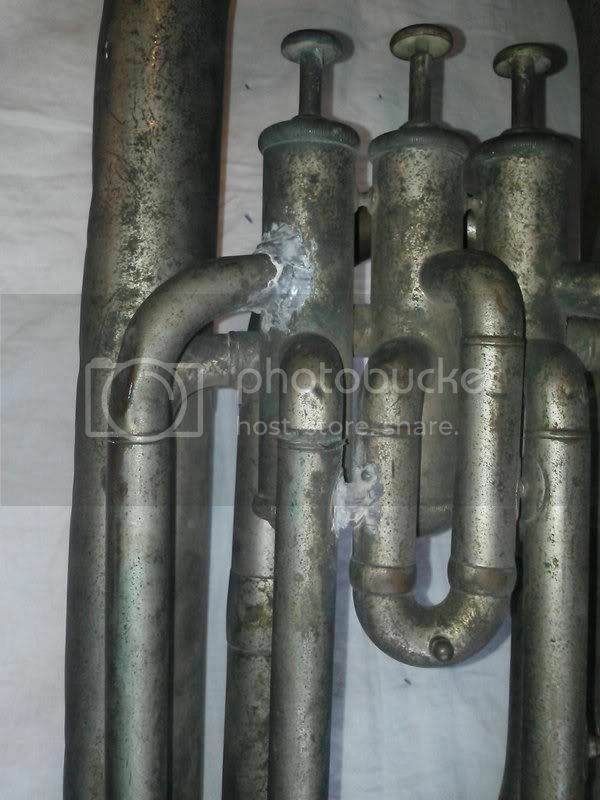 Don't know what options you have there, that would be reasonably economical, but if it came down to using some copper water supply pipe of the wrong size, I'm guessing even that would turn out better than trying to bring that original leadpipe back to life. I've got some Blue Magic, but would the Brasso hurt the silver at all? 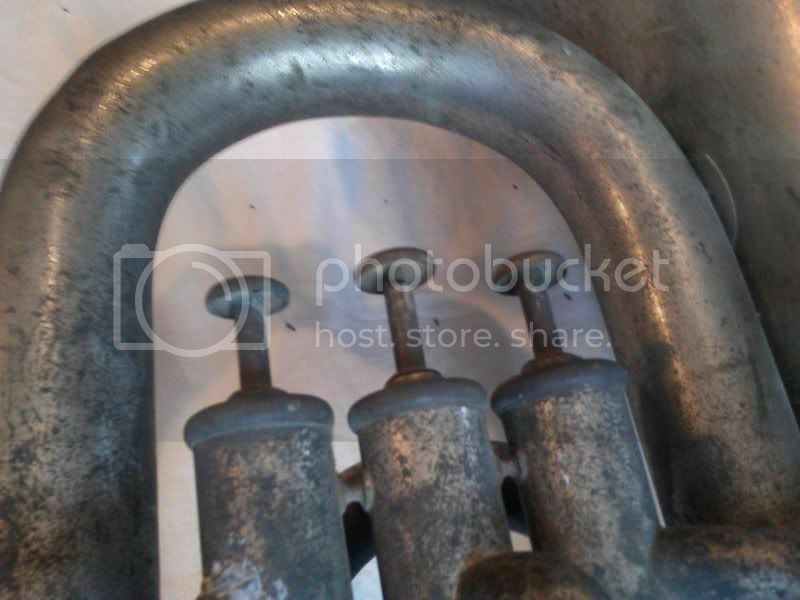 Old Boosey and Besson mouthpieces with the old smaller shank, almost as bass trombone shank, does come up every now and then on eBay UK and they do not normally cost so much. 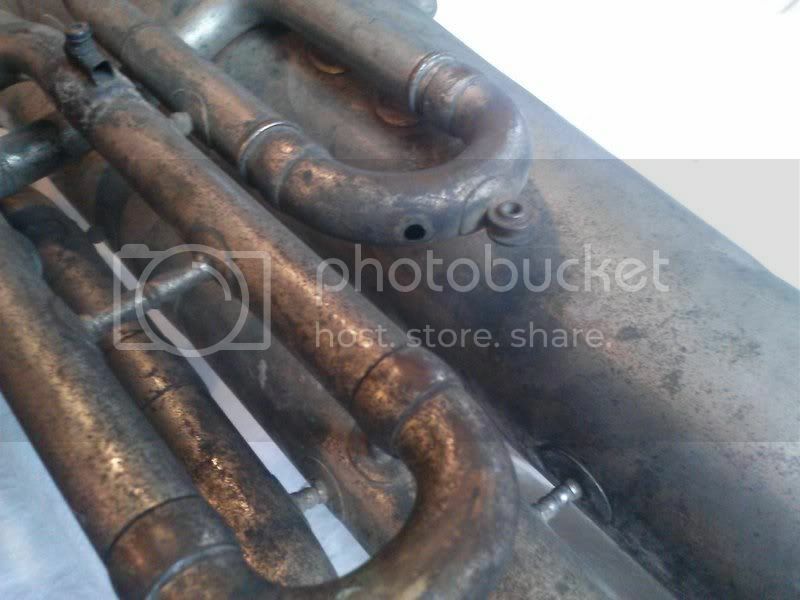 Lingon wrote: Old Boosey and Besson mouthpieces with the old smaller shank, almost as bass trombone shank, does come up every now and then on eBay UK and they do not normally cost so much. A few years ago I got a Chinese Wick knockoff, brand new from ebay. Something like $30. Fit in a 50's Conn Eb student tuba. 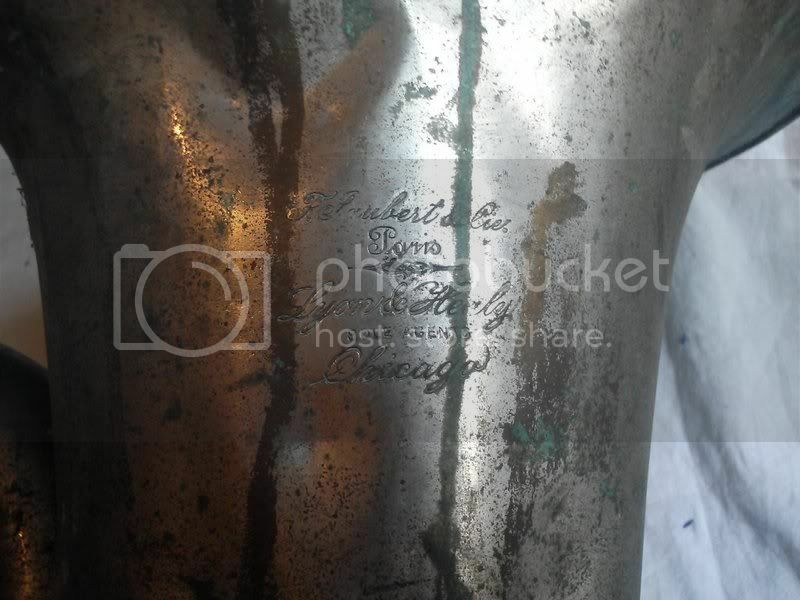 Tubajug wrote: I've got some Blue Magic, but would the Brasso hurt the silver at all? 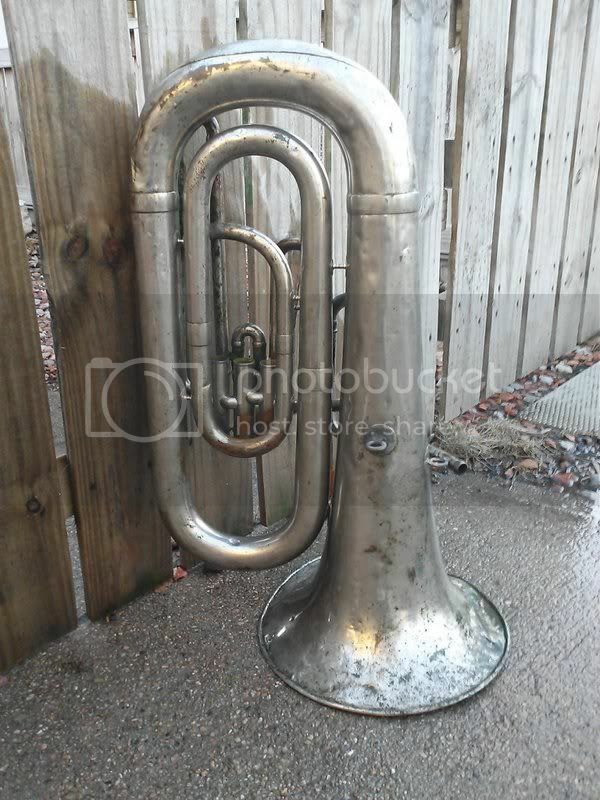 My bad, I though the horn was tarnished brass. It does not look like the tarnished silver I've seen in the past. 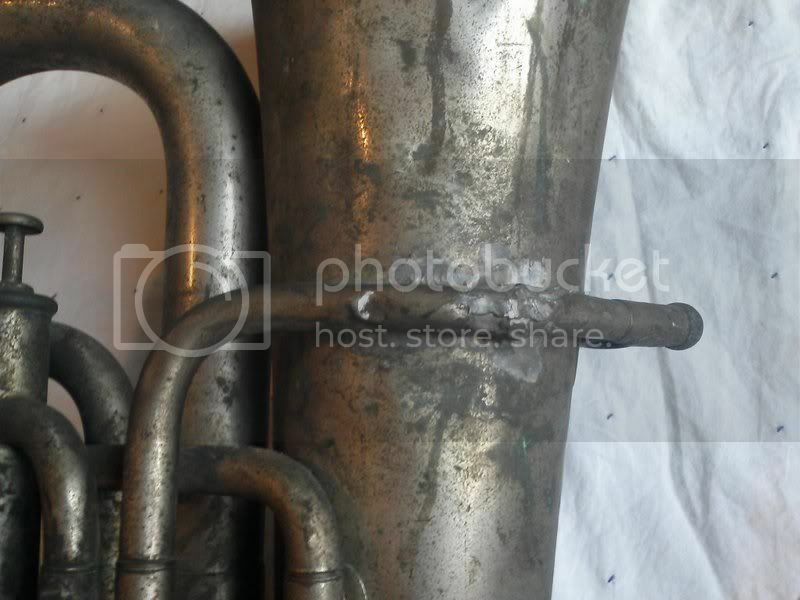 Is it possible that the horn is actually nickel-plated? I'd start with the blue magic since you already have it. 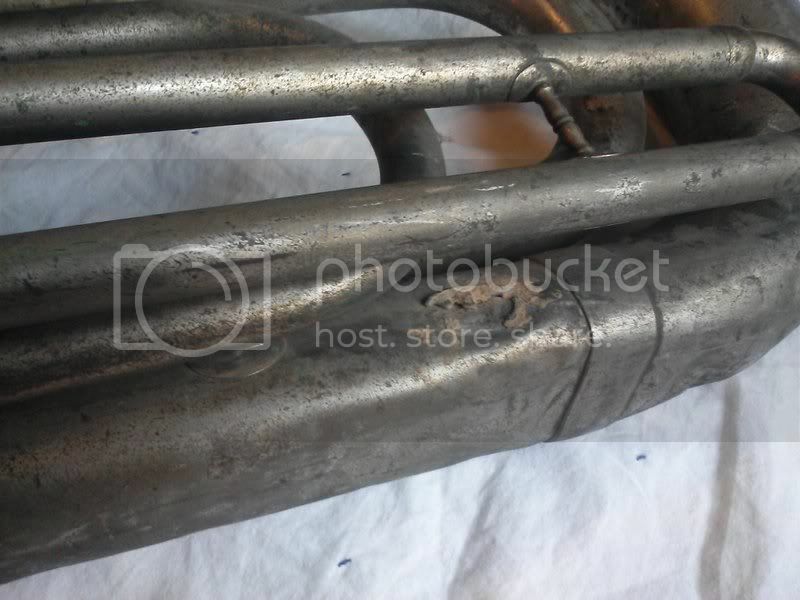 Also, I've had relative sucess rolling out the bell crease with a rollin pin on an older horn. I use Amway Metal Cleaner on my silver plated horns; it works fairly well and it's cheap, $4.95 a tube. Thank you to everyone who has posted so far. I now have a few follow-up questions. Is there any particular order I should follow in terms of dent removal, tarnish removal, unsoldering etc? I guess what I'm asking is, if I start taking it apart (I'm feeling ambitious and want to go after that flat side after all), will the heat from the torch "bake on" the tarnish in any way? Should I get nice and shiny first? How does silver plating react to heat? I know lacquer should be stripped off of brass before applying heat, any rules with silver? 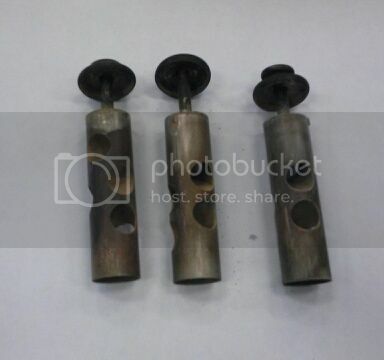 PMeuph wrote: Also, I've had relative sucess rolling out the bell crease with a rollin pin on an older horn. Could you elaborate a bit? I'd be interested in doing a bit of that part myself, I just figured that would have to be something I leave to my tech. Thanks again for everyone's input so far. I'm looking forward to playing with this for a while. I hope no one's on the edge of their seat waiting to see this finished! PMeuph wrote: Also, I've had relative success rolling out the bell crease with a rolling pin on an older horn. Everything I've "learned" I've either used trial and error or youtube videos. In this video, there is a tech that uses a tool similar to a rolling pin to take out dents. I basically mimicked the movements but without putting the rolling pin in a vise grip (I don't have one.) Instead, I put the bottom bow of the horn on the ground and held it between my knees while I worked with the rolling pin. There are probably other/better/more efficient ways of doing this, but this has worked well for me. Thanks for the link. I'll give the rolling pin a try sometime. First thing this horn needs is a bath... I was getting some dents out and my hands were brown just from handling it. Our local music store loaned me a couple Denis Wick mouthpieces to try and the 4 fit right into my horn, so maybe the receiver isn't such an odd size. 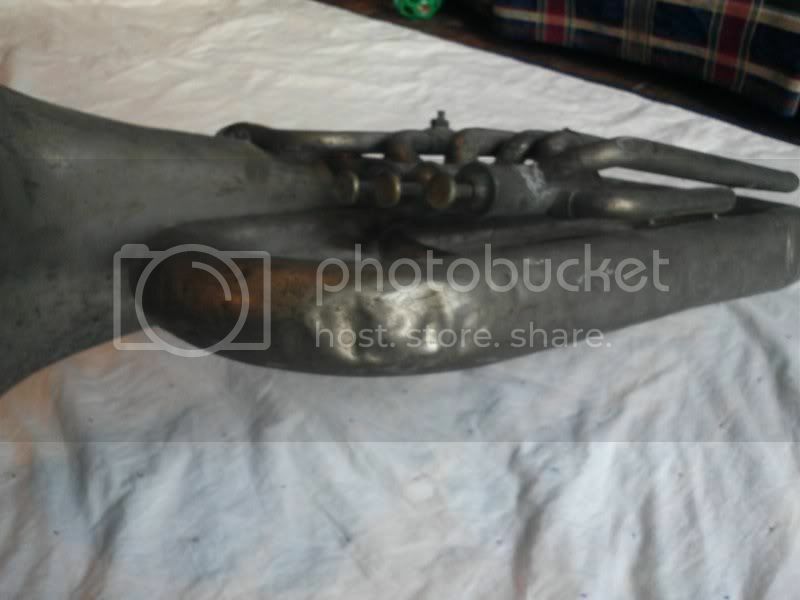 The horn plays really sharp (it reads as an E on my tuner), but with the leaks (which I believe I found in the lead pipe, and possibly the third valve with that glob of stuff on the knuckle), who's to know how it will play eventually? Anyone know how to remove JB Weld? I think that's going to be my biggest challenge. JB Weld wrote: When fully cured, J-B Weld can only be removed by grinding or filing it off, or by directly heating the product above the 600º maximum temperature threshold. Hah, I embedded the link the in the quotereer! 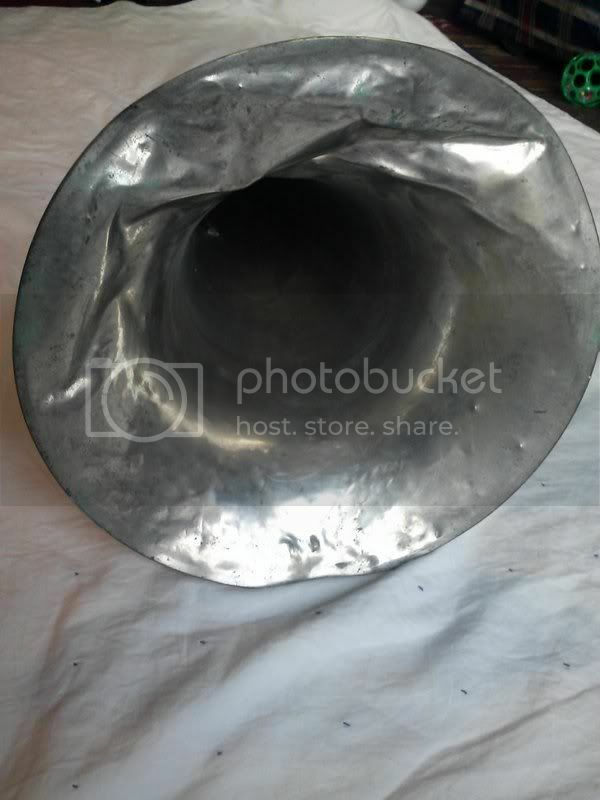 One of the repair techs on this board posted this in his blog and I thought it worked well on a black sousaphone I was working on a few months ago. I recommend following up with polish. Looks like the Dremel I got for Christmas has another job to do! Thanks for the Tarnex/baking soda idea. I'll have to give it a try! The slides are still completely stuck. I was hoping that they might loosen up after a bath, but so far, no dice. Sorry this isn't as interesting as Wade's thread, but thanks for looking! What have you done to YORK #3 ??????? Actually, I think its a great experience. What is the worst that can happen. Those are the kind of projects I like to experiment with (tuba or non-tuba related), ie if I totally screw it up, oh well, I can live without it.